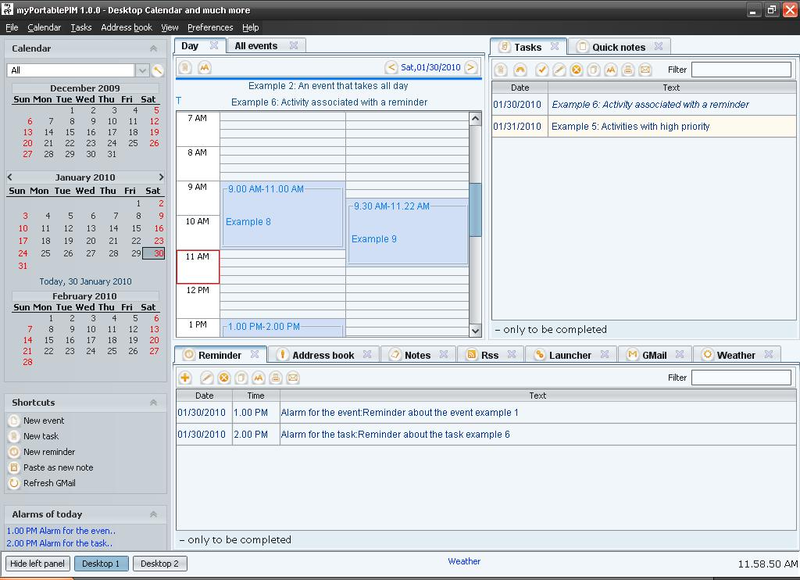 Desktop calendar with many functions.Day's event,tasks with alarm,GMail checker,twitter client,image viewer,notes,feed RSS,launcher,password manager,web search, weather,tracking and address book. myPortablePIM is designed to be portable, used from a USB stick to always have with you your data.There is no installation.Just unzip the downloaded package and you're ready: no key and no log file written by myPortablePIM outside of it's installation folder. You can mark the day's events, tasks and reminders with alarms.You can set the tuition for them and send via email the details through the "Send email" button.Support the iCal standard to import and export.There are different views on the calendar: monthly, weekly, daily and personalized.You can create several calendars with different colors thus being able to identify the events easily.There are two views, called Desktop 1 and Desktop 2, where arrange your windows as you want.You can switch from views by the button on status bar. The RPT Software - Donation Management software is the most user friendly and affordable donation software on the market today. Starting at just $90 we provide a complete fund raising package with all the features found in other software packages. inPreso Screens is a simple software mock-ups and website wireframes design application. With inPreso Screens you can design low and high-fidelity wireframes, add simple interactivity and instantly publish your wireframes on web. Flooring Manager is a free consumer app for layout of laminate or plank floors. Different styles, size and materials supported. Free for non-commercial use. Includes printable layout drawings. This site does not contain serial number, crack, keygen myPortablePIM serial number : serial number is the simplest type of crack. A serial number(cdkey,product key,etc) is register the program as you may already know. a crack or keygen may contain harmful software. If you cannot find the exact version you want, just give it a try. for more information read .nfo/.txt/.diz file include in zipped file.